Here’s another annual “Best…” list, this time focusing on education policy. 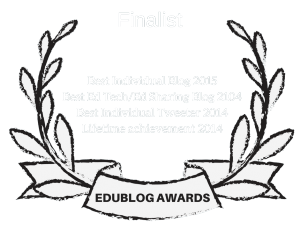 You can see my picks for the first six months of the year at what functions as Part One of this list: The Best Articles, Videos & Posts On Education Policy In 2013 – So Far. And you might also want to check out my Washington Post piece, Best and worst education news of 2013. Valerie Strauss at The Washington Post published an absolutely terrific interview with famed teacher an author Rafe Esquith. It’s a must-read. In fact, it should go on so many of my “The Best…” lists I’m not sure where to start…. Diane Ravitch was on The Daily Show. Here’s her two-part interview, which includes an “extended” portion that only appeared on the Web. You might also be interested in the previous time she was on the show — see Jon Stewart & Diane Ravitch Knock It Out Of The Park! Paying Economists by Hair Color? Thoughts on Masters Degrees & Teacher Compensation by Bruce Baker is one of the best pieces on education policy I’ve read in awhile. 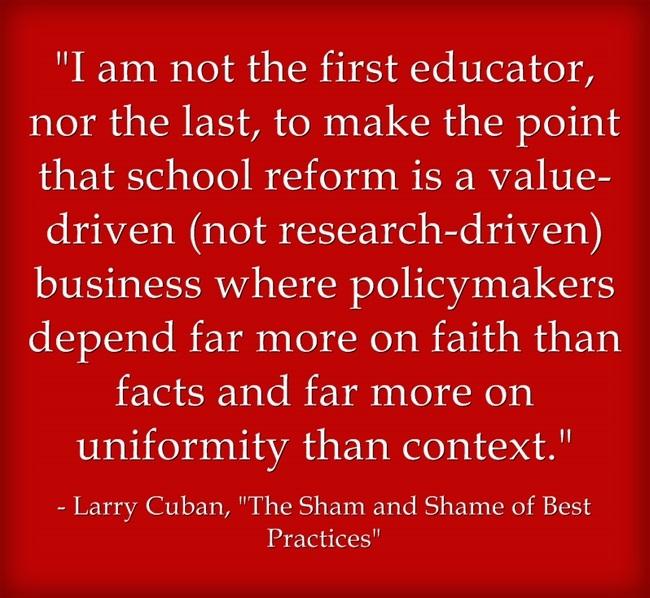 Larry Cuban published an important post titled The Sham and Shame Of Best Practices. He discusses how the concept of “best practices” is adapted from the medical world, where it has also been criticized. According to Groopman, experts who recommended “best practice” treatments (and their advice became Medicare mandates to all physicians) “did not distinguish between medical practices that can be standardized and not significantly altered by the condition of the individual patient, and those that must be adapted to a particular person.” He gives the example of putting a catheter into a blood vessel, a procedure that involves the same steps for every patient to avoid infection. This “one-size-fits-all” mechanical procedure differs from prescribing a “best practice” for a complex disease such as diabetes, congestive heart failure, or breast cancer. Not making this critical distinction leads experts to overreach in their recommendations to practitioners and, in time, turn a “best practice” such as hormone replacement therapy for women into a fad. A similar situation plagues school reform. Reliability and Validity of Inferences About Teachers Based on Student Test Scores by Edward H. Haertel from Stanford University was published by The Education Testing Service (ETS). It’s an extraordinary critique of the use of Value Added Measures in teacher evaluation. I’m adding it to The Best Resources For Learning About The “Value-Added” Approach Towards Teacher Evaluation. Forever young: the new teaching career is by Mike Rose. I’m adding it to The Best Posts & Articles Raising Concerns About Teach For America. Teaching Lessons: What KIPP Did—and Didn’t—Learn From America’s “Best” Teacher is an excellent post by Andrea Gabor. 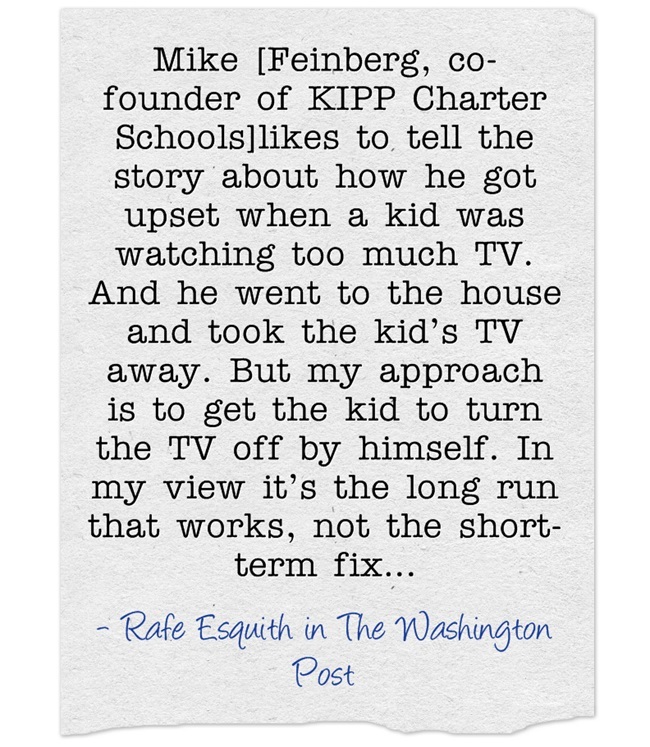 I’m adding it to The Best Posts & Articles Analyzing Charter Schools. Five basic lessons on public education (short and long versions) is from The Washington Post and was written by Brian Langley. I’m adding it to The Best Articles Providing An “Overall” Perspective On Education Policy. 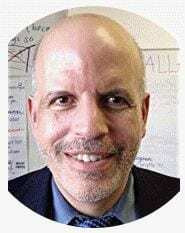 I’m obviously biased, but I really like ‘Teacherpreneurs Can Lead Reforms’: An Interview With Barnett Berry , a post I did over at Education Week Teacher, and “There Are No Shortcuts”: An Interview With Rafe Esquith, another one of my Ed Week pieces. Why we can’t all get along over school reform is a post I wrote for The Washington Post. You might also be interested in seeing all 1,200 of my “The Best…” lists.